What are the advantages of forced action mixers? Professional Builder speaks to SoRoTo to find out. The cement mixer, also known as the ordinary drum mixer, is the preferred mixer in most parts of the world. The reason being, that in most parts of the world, they just don’t know that there’s an alternative, but the fact is that forced action mixers can be used in a huge range of applications, including the mixing of concrete, render, mortar, the in-vogue resin bound gravel, screed and plaster. So what are the benefits? The ordinary drum mixer doesn’t have gears, and often very little copper in the windings of the motor. The shaft only drives the V-belt in a cement mixer, so there’s no need for it to be as strong as the shaft and gear motor of a forced action mixer. On a forced action mixer, the shaft drives a number of gears, and the force needs to be able to reach the shovels/blades – and they need to be able to mix a potentially tough product. This is why the motor and gear have to be powerful in a forced action mixer. Because of the forced action mixers superior force – and because of its construction – the mixing time is cut short. And it is much easier to estimate the mixing time. Most mixes only take around three to five minutes in a forced action mixer. But this doesn’t mean that you should always choose a forced action mixer over the regular cement mixer. They each have their qualities and attributes. It is not preferable to mix earth-moist concrete (EMC) in a cement mixer, for instance. The mixture often gets too wet, so that when screeding or plastering, water will keep surfacing – or some of the product will turn into small snowball-like, compact balls. In addition, a quality tumble mixer is sometimes better at mixing concrete with aggregate than a forced action mixer is. This mix is often easier to get out of a tumble mixer’s drum than out of the chute of a forced action mixer, and this kind of concrete is often laid in a thick layer, where all the molecules don’t have to be activated, and so there is no need for the efficient forced action mixer. If you do mix concrete with aggregate in a forced action mixer, make sure to use mixing arms with rubber blades. SoRoTo was established in 1986 and is a leading manufacturer and supplier of forced action mixers and belt conveyors. Its original forced action mixers have built a reputation for durability, with a service life that has extended to more than twenty years. Indeed, the company spends at least three years testing and developing its units before they are launched to market, and they are produced in collaboration with end user demands. That’s why there are a number of features, like a bracket mounted on the machine for holding a brick trowel, and a bucket stand, that will immediately appeal to tradespeople, whilst safety is also acknowledged with a safety grid in front of the discharge chute, as well as a safety switch. Models 200L and 300L are equipped with a spare power outlet for work lighting, or industrial vacuum cleaners, and the machines are equipped with a rubber strap that ensures the grid lid does not open during use or transport. Given that the SoRoTo mixer arms are removed without tools cleaning, or interchanging between rubber/steel systems, is made much easier. Loading wheels and the use of custom-made lowered bolts also ease your loading of the machine onto a truck bed, and telescopic legs can be adjusted between 100 and 140cm, depending on the model. Dust is now one of the industry’s major safety concerns, and this is something that the company has addressed with the option of a dust controller. 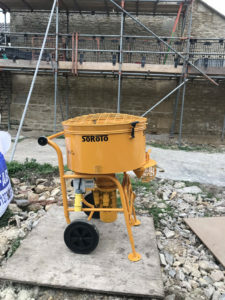 SoRoTo Mixers UK is pioneering a trade-in scheme which gives contractors and tradespeople an opportunity to exchange their current forced action mixer for a discount of up to £500 against a brand-new model. With so many contractors working with older, worn and potentially unsafe forced action mixers in the construction industry, this scheme aims to improve the quality and efficiency of the work of the operators, as well as improving safety standards in potentially dangerous environments. 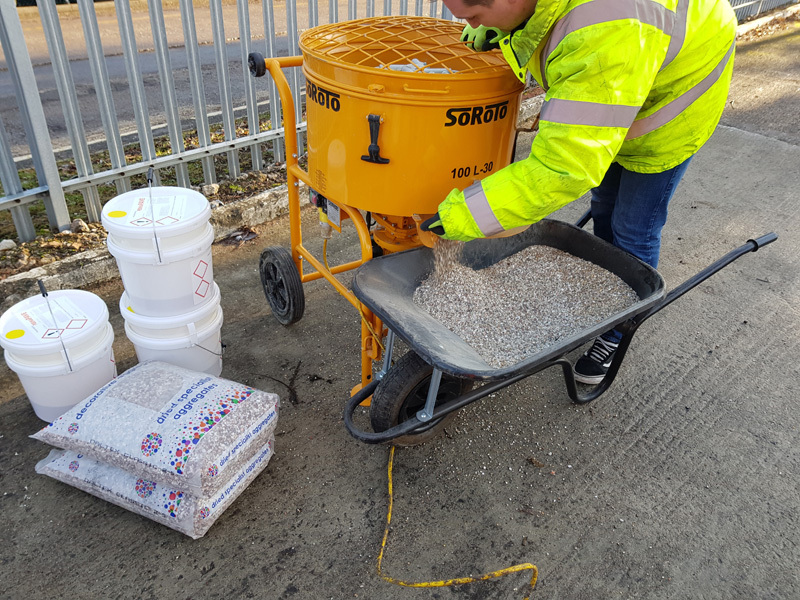 The SoRoTo range extends from a super-portable 40L model which can mix up to ~100kg of concrete per full load, to the gargantuan 300L which has a maximum capacity of ~700kg per mix.